No matter how good your other marketing strategies are scaling out, there comes a time when you feel like foraying into email marketing. Sometimes you have to go out of your way to cold email and make an outbound strategy to boost your sales. And it actually turns out to be a great thing for their business. 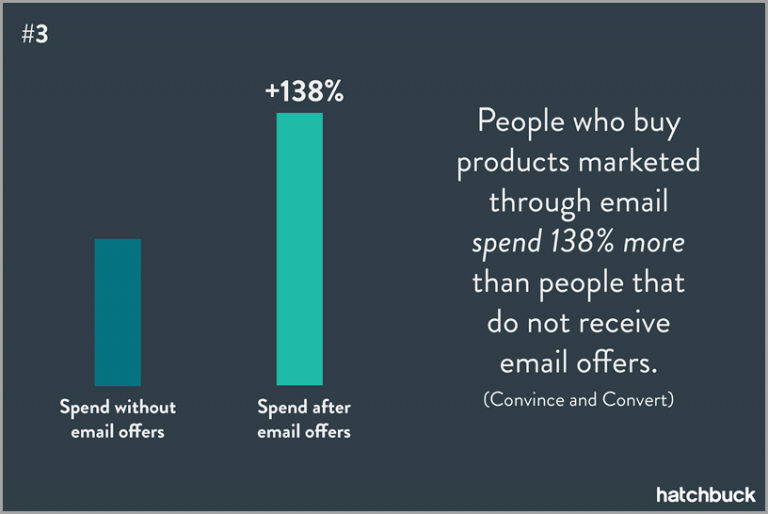 A report stated that people who buy products marketed through email, spend 138% more than people that do not receive email offers. So you know that it is not something you can simply ignore. Now email marketing is nothing without email addresses. That said, finding someone’s email address is arduous, to say the least. And it’s the same case for everyone – be it an evangelist or a novice. So to make this process a little bit easy for you, today we will discuss how you can find email addresses using companies’ names. This post basically deals with a few methods for acquiring the email addresses of crucial business leads. Start with just a simple search on the Google Search dialogue box. This might seem absurd at first because of all the clutter you know you would be faced with. However, you will be surprised to know how effective it can actually be. Let me tell you that sometimes the chances are that the email address would simply pop up right before your eyes. Wouldn’t it be amazing to get the desired email address just with a simple click without going through any hassle? Sometimes, it works like a charm and you get your result in one go. Google will find anywhere this combination appears. So, click, type and allow the Google Search Engine to do the rest of your job. Yet, if you really have tough luck then read the methods mentioned further. Well, Yes. It might seem a pretty obvious method like the previous method yet you may not have had the eagle’s eye to look out for their email address in their contact page. The most obvious place to look for a contact email is the contact page. Note that if it is an organization with multiple people, a general contact like “info” or “support” might not be the best email address to reach the person directly, in which case you may want to try another tool or method. Apart from the Contact page, even the about page is a good place to look for a person’s email address. Companies have their leadership team listed on the about page and you might find anything from a brief bio to detailed contact info for every team member. Dig around a bit, and you might find email addresses in unexpected places. Some people hide these About us and Contact us pages in footers, in random links in the sidebar, or in author images. If you still can’t find these pages, just try putting it in the web address bar as in the examples below. 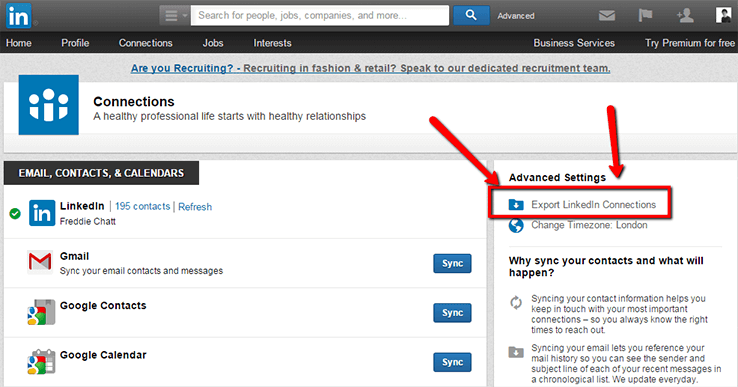 LinkedIn is also worth exploring for email addresses. Many people will display their email address publicly on their LinkedIn profile. Sometimes an email address is required to connect with someone, so displaying this information on the profile makes it easy for people to connect with them. Chances are good that some of your connections on LinkedIn fall into the realm of outreach targets. It also lets you export contacts and their email addresses if they’re available on their profiles, for an easy way to find addresses of anyone you’re already connected with. This will create a spreadsheet where you can easily search and find the email addresses you are looking for. While people don’t usually add (although you never know) their email addresses on their Twitter bio, however, they get asked for their email plenty of times on Twitter. 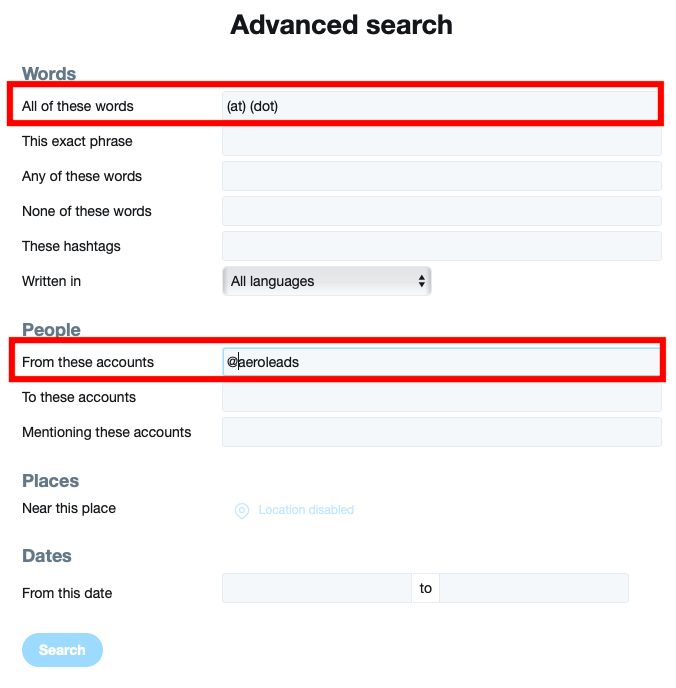 Thus, you can leverage Twitter’s advanced search queries in order to unearth the email address of your prospect. Please note that you should be aware of the company name of your prospect to get the desired results. You can also set a particular location to narrow down your search if are sure of the location of the company or the prospect. Also, don’t try searching for the word “email”, else you will be faced with an overload of irrelevant tweets talking about the “email” as a topic, but not the actual email address. Until now we have discussed strategies that are wonderful but still have some obvious downsides. For starters, it is nearly impossible to find email addresses in bulk using the aforementioned ways. For example, can you even imagine opening up “About” or “Contact’ page of thousands of your prospects just to find their email addresses? Secondly, the chances of success are 50-50. In fact, the probability of you not finding the email address is probably more than finding it. And most importantly this way is very arduous and not many people would be up for this task. To overcome these mentioned problems, we do have various automated chrome extensions that will help you find email addresses in bulk very quickly. Clearbit is not only available on Google Chrome but also has an Outlook extension. The company claims that Clearbit can find email addresses in less than five seconds. If reviews are anything to go by, this claim has been proven to be accurate 97% of the time. All you have to do is to enter your prospect’s company name with their first name and designation. Clearbit with search profusely on the Internet and you will get your result very quickly. You can also compose an e-mail to that person by clicking at once. 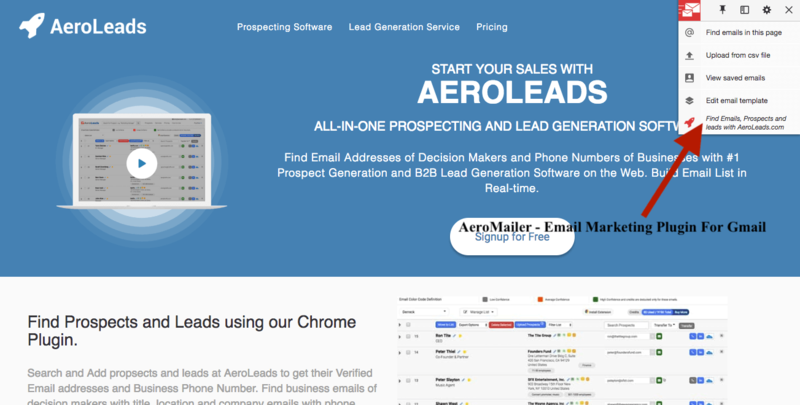 AeroMailer is a prominent email marketing plugin for Gmail and Google Apps. This email marketing Chrome extension helps its users find email addresses on just about any webpage on the internet, save it and send email to them via Gmail or Google Apps. Click here to try AeroMailer for yourself. Furthermore, AeroMailer is equipped to create email templates, upload emails via CSV files and to send mass automated emails. Findthat proceeds with the search of the desired email addresses very quickly and without any hassle on your part. They offer various plans including a free pack (including 15 monthly credits) and a team plan for $149 per month (including over 3,000 credits). Click here to try Findthat for yourself. Users just need to know the prospect’s companies names or domains along with their first name to get desired results. Findthat also offers an attached email verifier along with the email address finder extension. “Voila Norbert” is another popular email finding Google extension that can search email addresses by first name, last name, and company name or domain. Furthermore, Voila Norbert also makes sure that the acquires email addresses are correct via their own email verifier. It is also extremely easy to use and provides additional services like personalization, segmentation, verification and more. 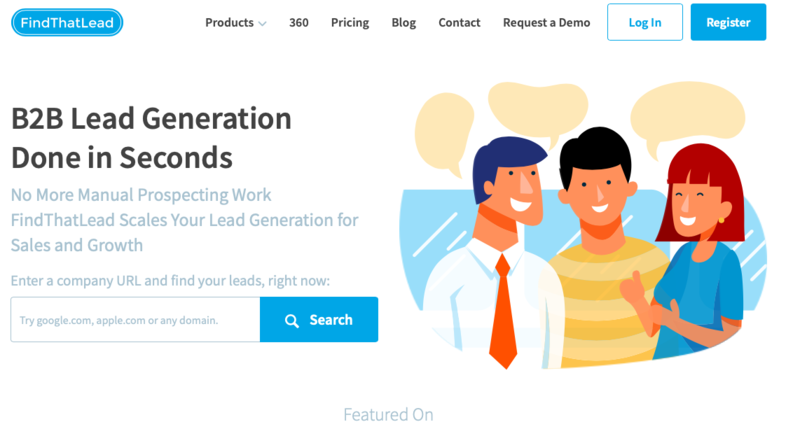 FindThatLead allows you to find your prospects’ email addresses using their own name as well as their company name or domain. This is known to be a great source for account-based sales. Click here to try FindThatLead for yourself. FindThatLead offers free packs, along with paid packages, which includes 10 credits per day (300 per month). Moreover, the free package also gives you access to their Google spreadsheet which allows you to upload a CSV file with name and domains of your prospects. Hopefully, with these few easy methods, you can find almost anyone’s email address in just a few clicks. After finding the email addresses of your prospects, don’t forget to engage with them and initiate conversations with valuable contacts to expand your network, promote your brand or increase sales. If you are aiming to find only a few email addresses then you can try your hand with the mentioned manual methods. However, if you require emails in bulk, then you would have to use at least one of the aforementioned email marketing tools. So, don’t waste time any further and find emails to open doors to better sales opportunities and life-altering business relationships as well as leads. Would you be installing any of the email marketing tools? Or do you think manual methods are enough for you? Navaneetha great article, would like to appreciating your perspective to finding email addresses on the internet manually. 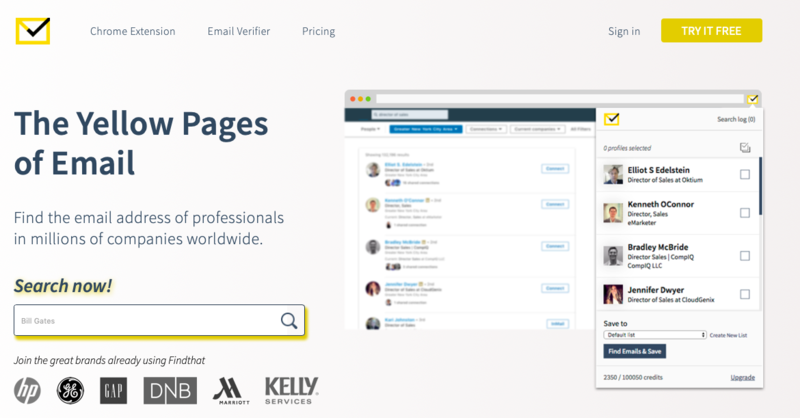 I recommend this automated tool https://www.egrabber.com/emailprospector/ , it also finds email address of anyone, when you enter their name and company. Watch live demo also by clicking on this link.